Happy Halloween everyone! Time for another baking edition of Kraftsy Kitties! 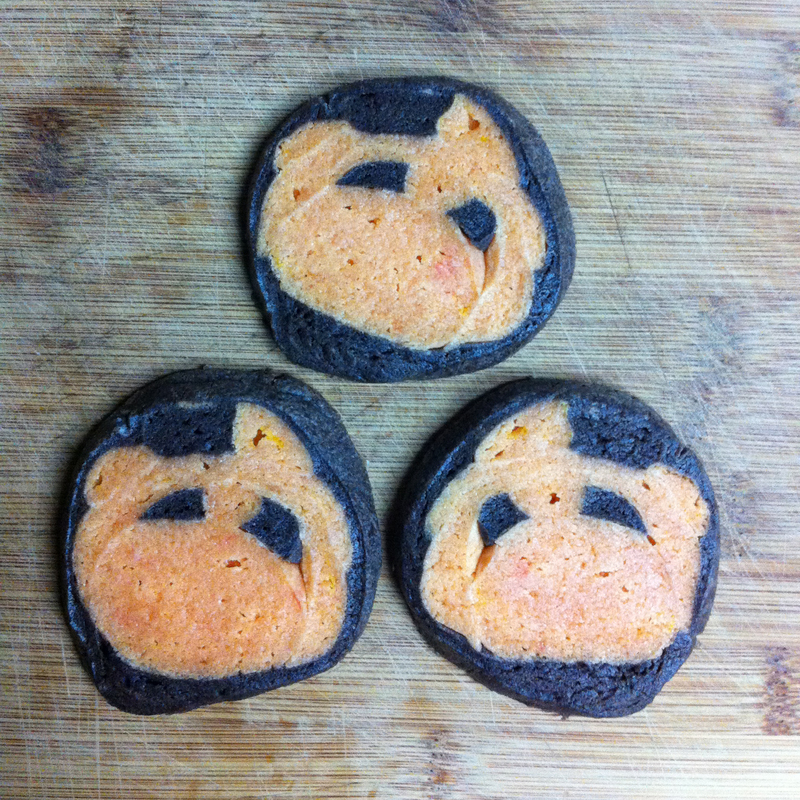 I was inspired to try making some kitty cookies based off the “pattern” for panda bread. This Japanese (of course) pinnacle of delicious cuteness is definitely worth trying, although most of my efforts in the bread arena usually end up looking a little – literally, what with the stretching of shapes in the whole rising thing with baking bread. 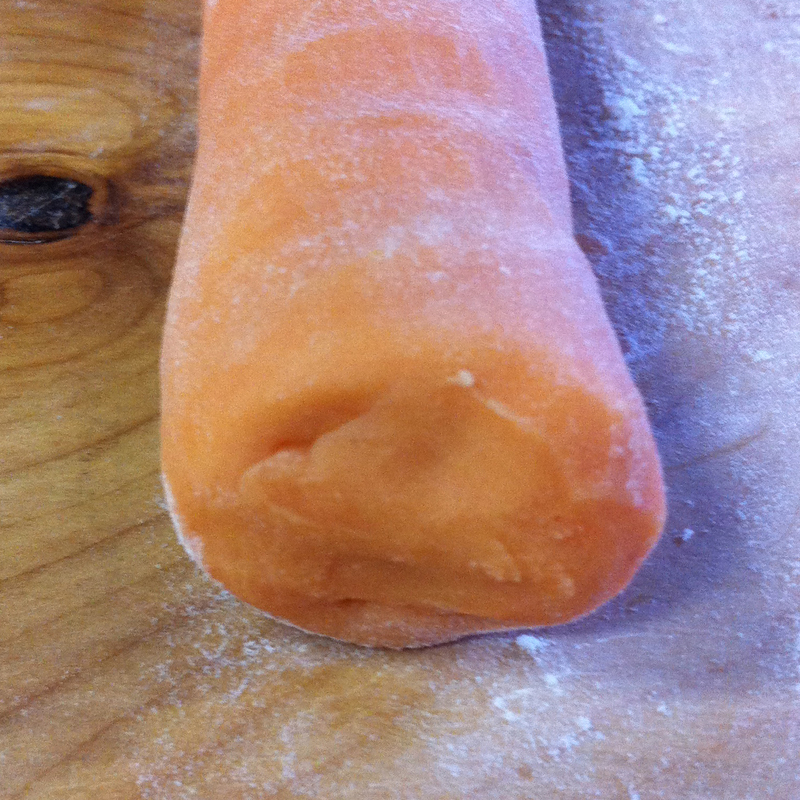 I’ve had really good luck with substituting bread dough for sugar cookie dough – it’s much easier to work with. In this version you’ll need two colors of dough; the larger portion for the cat face, and approximately half that amount for the contrasting eyes and rim. (About eight hours after I mixed up the dough it hit me that a black cat would be more suitable for Halloween, but then again, all cat things I make end up being orange tabby, naturally.) This recipe is actually great for when you don’t have a long chunk of time to bake at once, because the dough works best when you can chill it. I love this cookie recipe for its simplicity. To color, either add a few drops of food coloring, or a tablespoon of dark cocoa powder. I often use matcha powder to make green tea cookies. Halve the amounts for the contrasting dough. I just use a whole egg, but sprinkle in a bit more flour if the dough seems too quickly. Beat all ingredients in a stand mixer. 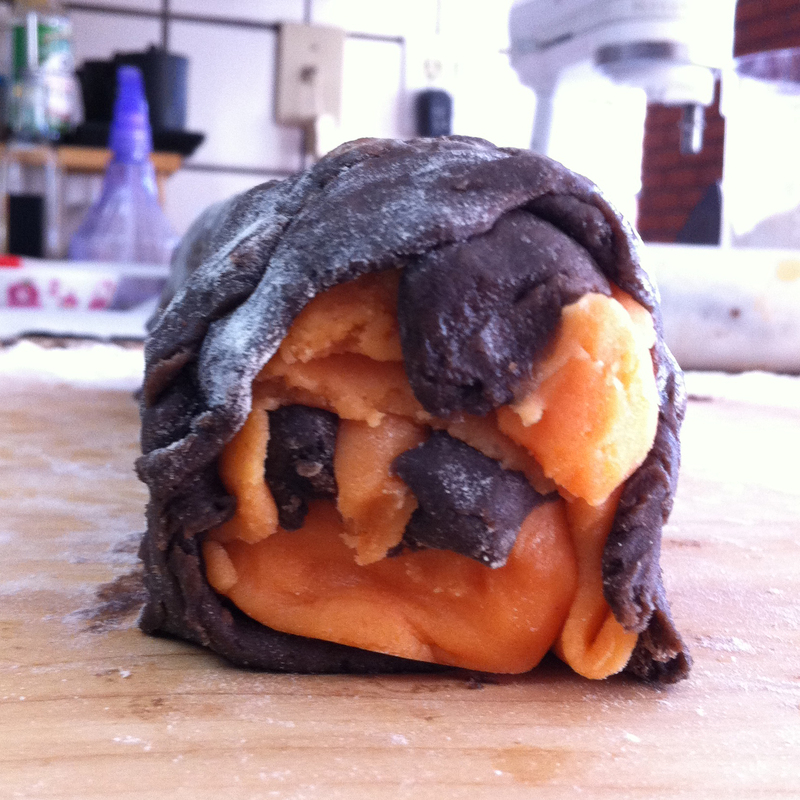 Chill the dough in the fridge for 2 hours or overnight in a covered container. 1. 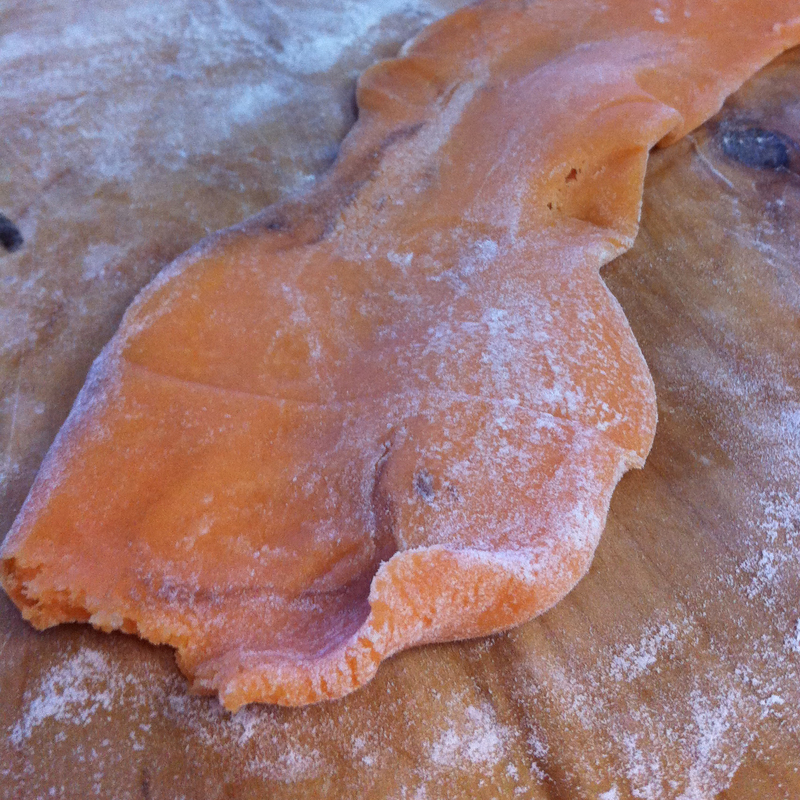 Roll about half of your main dough into a fat log shape on a lightly floured board. Press with your fingers into an oval shape. This will be the base of the cat face. 2. Next, the eyes. 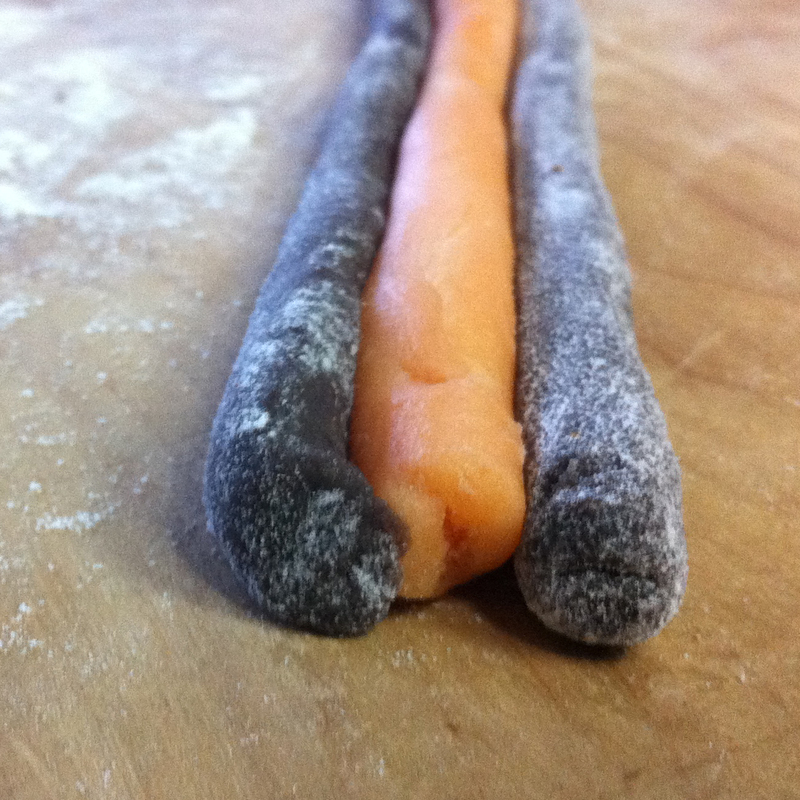 Roll two small ropes with your contrast dough. Keep the ropes round. 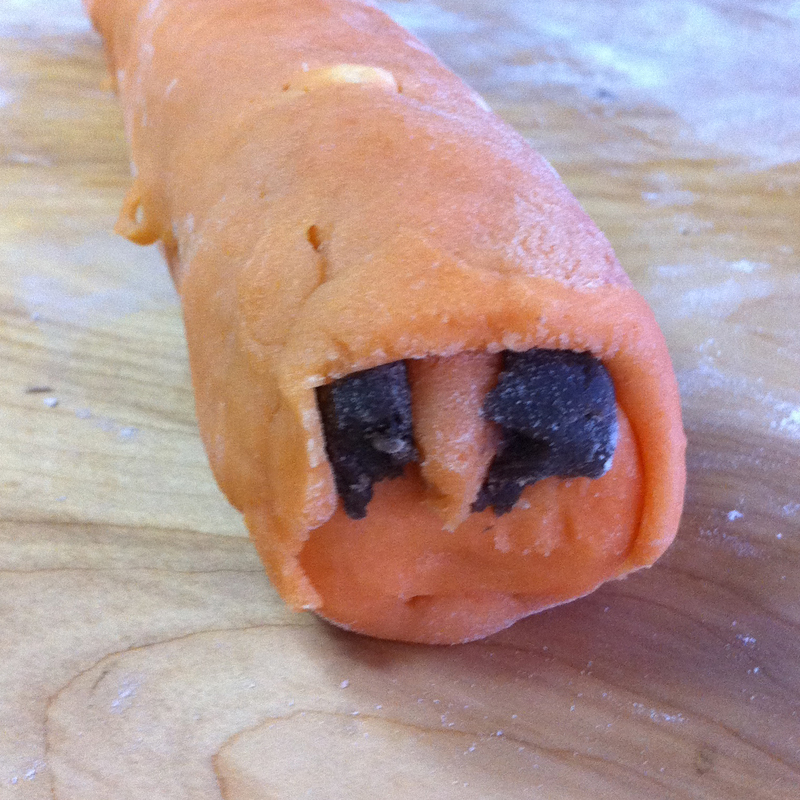 Add in a rope of your main dough to form the space between the eyes. Work quickly as your hands will warm up the dough, and the softer it gets the harder it is to handle. 3. 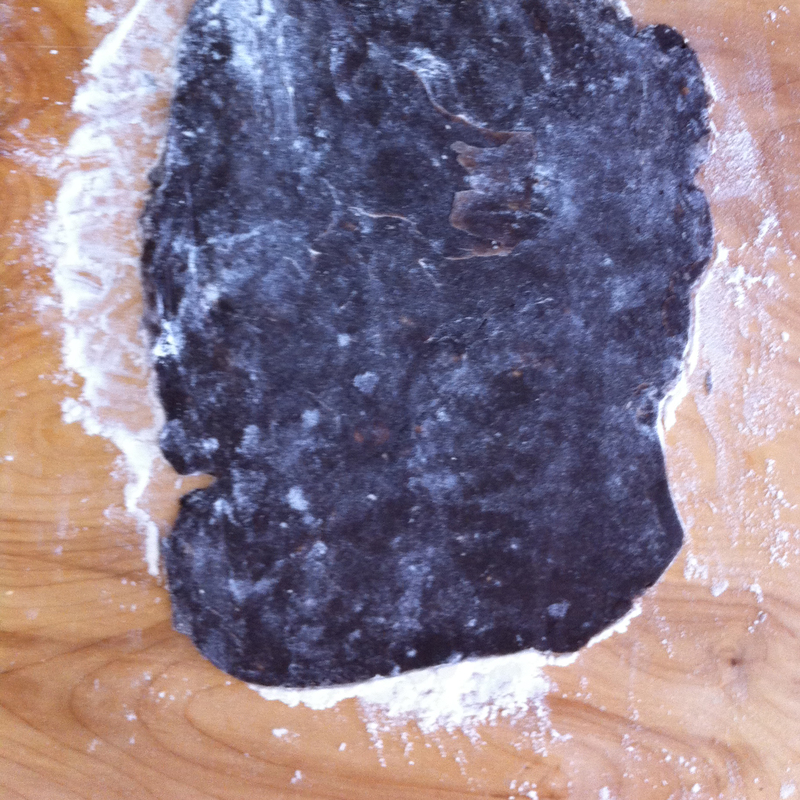 Next, take about 2/3 of your remaining main dough and rolling it out to a flat piece. Mine started getting a bit warm and too soft, so this is what happens when it starts getting all sticky. Still, this whole thing is pretty forgiving, so don’t stress too much if this happens you. 4. Put your eye roll (Step Two) onto your face oval (Step One.) Slap that flat piece (Step 3) onto the top and gently press it into place. 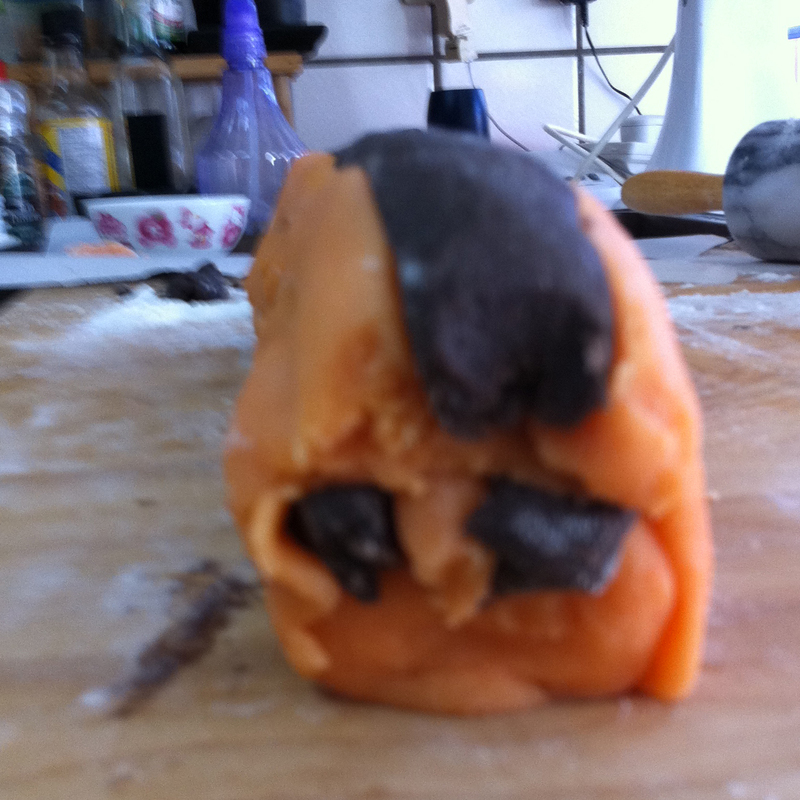 I found that it helps to have that flat piece ready…or else the eye parts have a tendency to roll of the head. Moistening the dough with a pastry brush dipped in water as you put them together will also help them stick, but I like having that top-of-the-head piece on there to help keep it all together. It doesn’t need to wrap all the way around the face – just around the eyes is fine. 5. Next, the ears! This is basically a repeat of Step 2, but reverse the colors. Also, this time, instead of making the ropes round, flatten each rope into a triangular shape, including the middle pieces. The middle channel will be slightly larger than your ear pieces. 6. Holy out of focus camera! Sorry about that, but you can see the ear segment plopped on top of the head now. 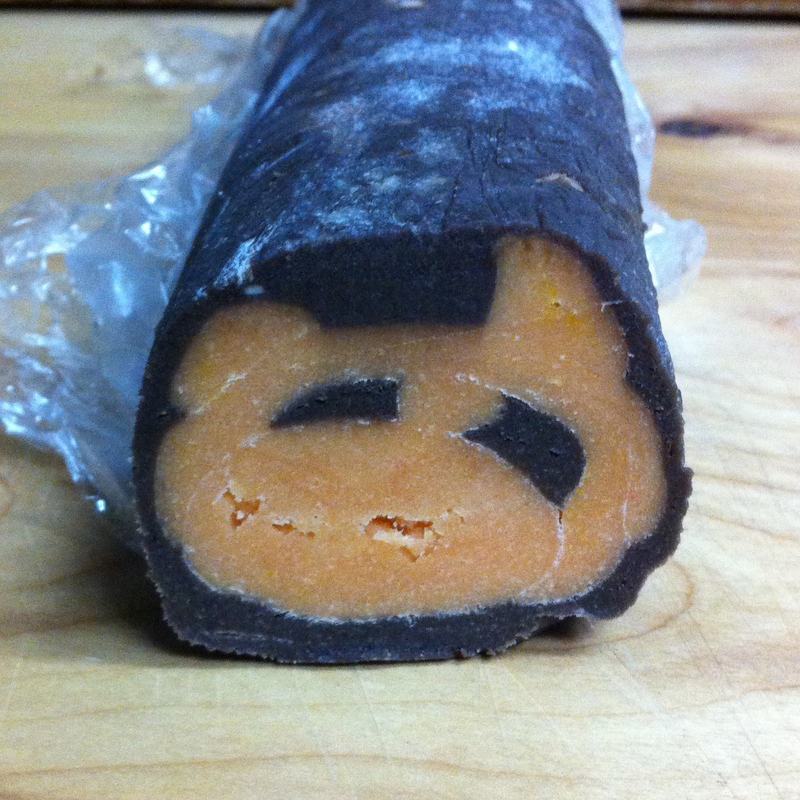 This is probably a good point to mention that you should start with a modest cat-face piece in Step One because this cookie log is just going to get bigger and BIGGER. Looking a bit more recognizable as a kitty face now? 7. 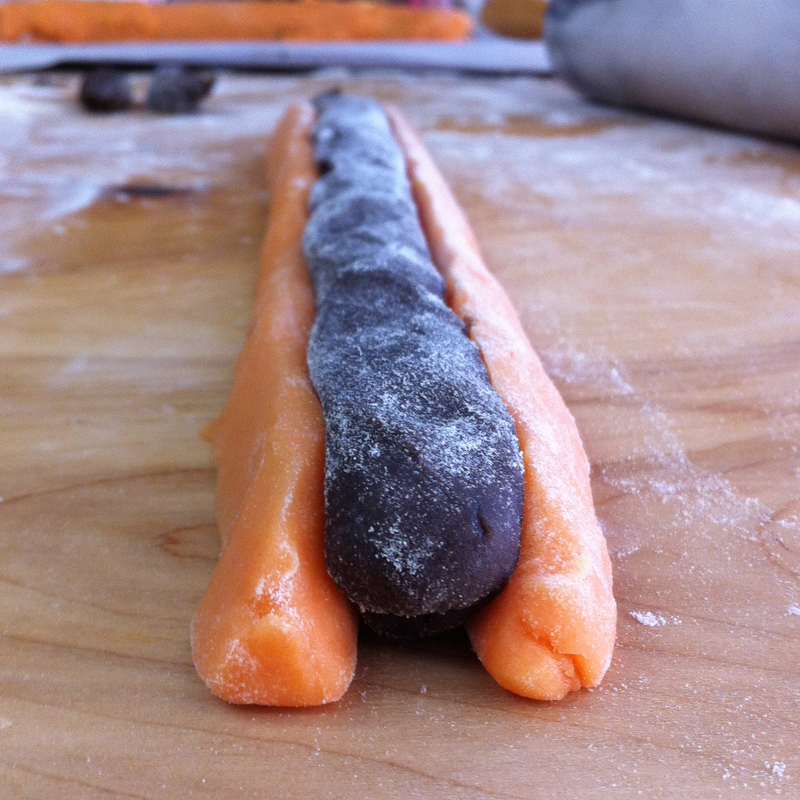 Roll out your remaining contrast dough into a rough rectangle. 8. And slap that sucker around your log. Almost there! And the end bits always look kind of wonky. 9. At this point, your log might feel a bit precarious, because the dough might not be sticking that well together. If you try to bake your cookies like this, all your segments are going to fall apart, trust me. 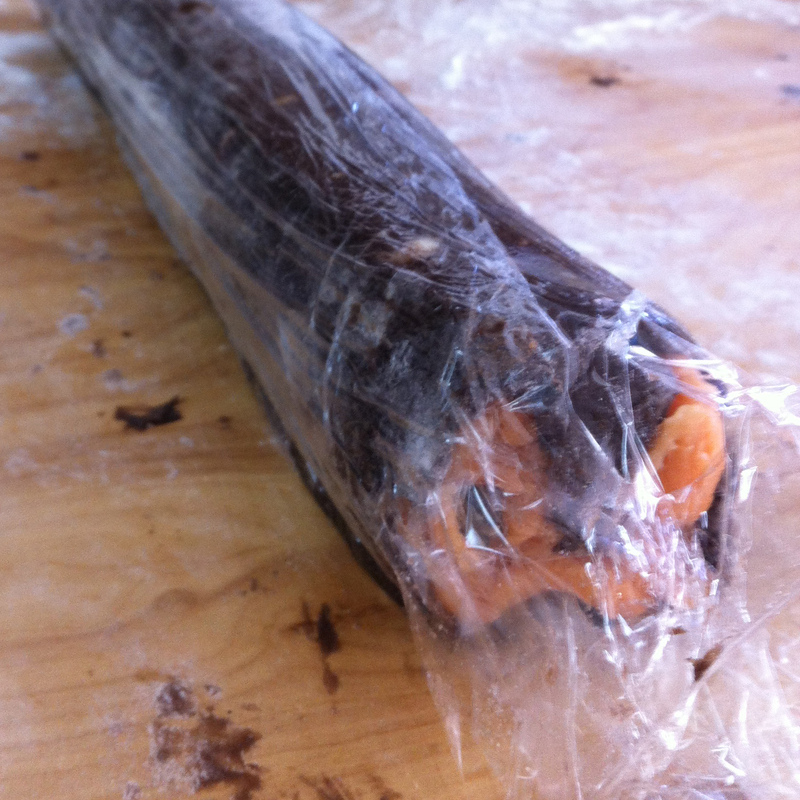 So, wrap the WHOLE LOG in plastic wrap, like a sushi roll. Then you can slide your hands down the length while applying pressure to compress the dough together and get the air out. It’s best to chill the dough again at this point. You can also freeze your cookie dough for later use. 10. When your dough is nice and chilled again (2 hours to overnight) , use a sharp knife to cut off slices about 3/8″ in thick. Here you’ll be able to get a preview of your rolling abilities.